Why is there a tent in Falvey? A camp site? A new study space? No, this tent was erected by Nova 99%, a group of Villanovans who sympathize with the Occupy Wall Street movement. The Occupy Wall Street and other Occupy locales represent people“discontented with a corporate run America, growing inequality, destruction of the middle class, and the unregulated, avaricious financial gambling that brought on the world-wide recession,” according to one handout. 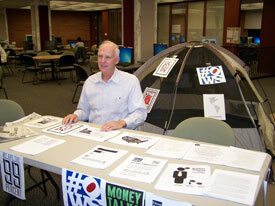 Ward Barnes staffing the Nova99% table in the Library. Nova99% evolved from a message posted on the University student newswire by Karyn Hollis, PhD, and William (Will) Stehl. Dr. Hollis is a member of the English department. Stehl is the associate director of Campus Ministry-Center for Peace and Justice Education. Nova99% members hope that others will post comments on the tent. Cywinski also said that Paul Sheldon, PhD, a member of the Psychology department, who, along with Dr. Hollis, is an advisor for Villanovans for Peace, has been an “amazing resource.” Dr. Sheldon, manning the information table in Falvey one afternoon, commented that he has been protesting a long time, since the Vietnam War era. Join the national conversation. Add your thoughts below. The tent should remain as long as the Occupy Movement remains peaceful. This week it departed from it’s original Peaceful Movement by entering and attacking the inside of Wall Street Trading area, causing police control violent action. Therefore, you are no longer supporting a peaceful movement. It is not Wall Street that is causing the Financial Crisis. According to Mary, the Mother of Medjugoria, it is our walking away from God, abandoning prayer in the family, and prayerful, Christlike lives that has brought on this world crisis. Watch the latest Video on “MaryTV.TV” given of the Vigil with Ivan, visionary of Medjugoria on 11-17-11 in the Cathedral of St. Steven in Austria to further understand the position of Heaven vis-a-vis these problems. The tent will be relocated to the Connelly Center next week as a symbol of ongoing support for Occupy movements across the country.